The Giant Green Arborvitae is the ultimate privacy hedge. It grows very fast and can reach a height of 60 feet with a 20-foot spread. Because of their size, it is important not to plant them too closely together. These plants are easy to grow in our area. You just need to give them a soil that drains well and plant them in a summer spot. 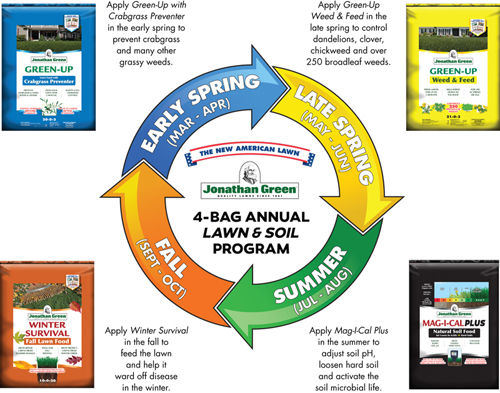 The New American Lawn by Jonathon Green is a four-step approach to lawn care. This program is cutting-edge because it not only feeds the lawn, like every program on the market today, but, unlike all others, FEEDS THE SOIL! For a healthy lawn all season long the soil needs to be free of compaction, possess healthy microbial populations, and have the correct pH so that roots can penetrate the soil to take up the food and water needed to be healthy and disease free. Here is how it works. Apply Green-Up Crabgrass Preventer to feed the lawn and provide season-long crabgrass control. Apply Green-Up Weed and Feed to feed the lawn and kill over 250 broadleaf weeds like dandelions, chickweed, clover, and oxalis. Apply Mag-I-Cal Plus in the summer to adjust pH, loosen hard soil, and activate the soil microbial activity. Apply Winter Survival Fall Lawn Food to feed the lawn and help prepare it against the long, harsh winter ahead.